Around 1811, there was a severe shortage of specie* affecting Scotland – not for the first time. 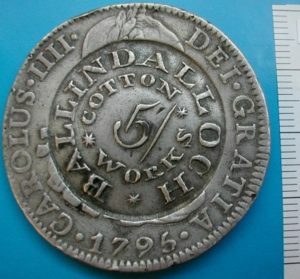 This shortage was partially alleviated by many business houses issuing counter stamped coins, and the three cotton works belonging to James Finlay and Company were prolific in their output. 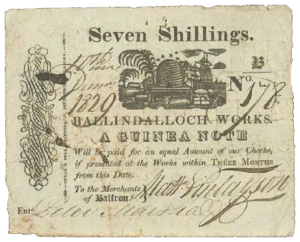 The Ballindalloch Cotton Works issued three known counter stamped coins – on a Spanish dollar they counter stamped “BALLINDALLOCH * COTTON * WORKS *” in two circular lines and a value of five shillings; on a French half ecu they stamped “BALLINDALLOCH COTTON WORK” around a woolsack (with no value stamped); and they also produced a countermark on a copper George III halfpenny. The Catrine Works produced five varieties of coins and the Deanston Works (also known as the Adelphi Cotton Works) issued seven varieties. 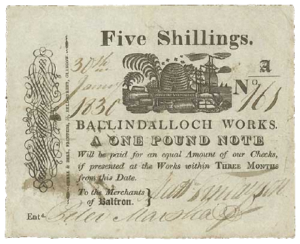 Obviously inspired by the release of counter stamped coins by the Ballindalloch Works, at least two other entities in Balfron undertook similar issues. 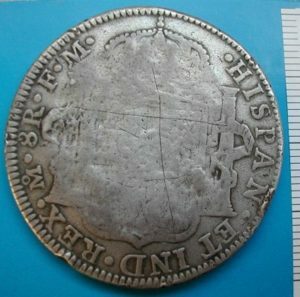 The Balfron “Victualling Society” (apparently some form of co-operative) issued a counter stamped George III halfpenny with “BALFRON : VICT : SOCIETY” in a circle, and I. Zuill (possibly a merchant) issued a coin counter stamped “I.ZUILL BALFRON”. *Specie: coin money, as distinguished from bullion or paper money. The shortage of specie in Balfron may have been exacerbated by the lack of a bank in the village – there being no bank until the British Linen Company (Bank) established a branch in 1836.